Yet, in the last year or so, the relationship has soured as Misha, upon resigning from his post, now accuses Petro of corruption and has sought to challenge his leadership. Earlier this week, the relationship reached its nadir — at least for now — when Ukrainian security forces sought to arrest the former Georgian President. Misha was accused of trying to overthrow the Ukrainian government and receiving funding from forces supported by former Ukrainian President Viktor Yanukovych to support that effort. 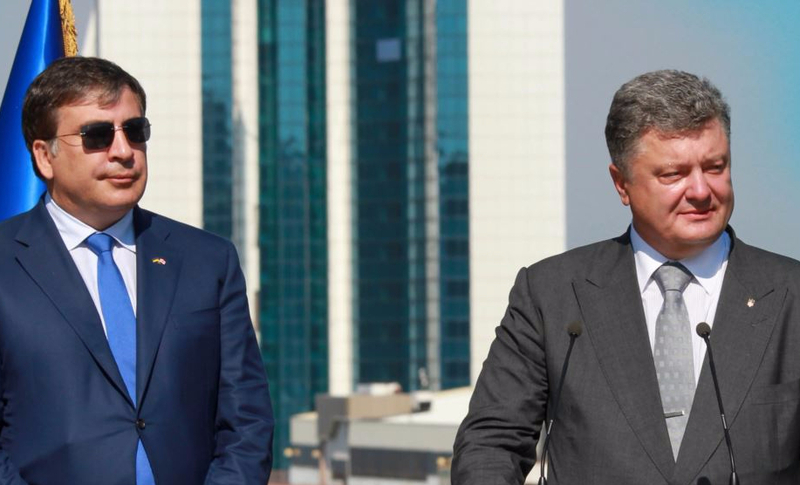 Saakashvili, for his part, denied all the allegations, claimed that Poroschenko was a thief and a traitor, and asserted the order to arrest him had originated with Russian President Vladimir Putin. Recent events are not just notable for the dramatic imagery of Misha fleeing to the roof of his Kyiv apartment building to the evade police and addressing the crowd from lofty perch, but even more so because of the gravity of the allegations. Both of the scenarios proposed by Karatnycky are troubling. That is much is self-evident. At this time, we do not know which interpretation is right, but it may not matter. It should matter whether Saakashvili is the victim of a nasty setup or in cahoots with Putin, but in today’s media climate, where the President of the U.S. decries any story he does not like as “fake news,” and where Russian bots continue to flood American social media with dishonest and nefarious aims, almost any information that comes out in the next days, weeks or months will simply harden existing positions. Any evidence short of an admission of guilt by Saakashvili — something that is almost unimaginable — or a decision by the Ukrainian authorities to drop the charges (something that is only slightly more plausible) will be simply dismissed by the other side. Moreover, the communications structures that exist today make it easy for either side to mobilize their base in the face of this potentially damaging evidence. Thus, one of the strangest, but most important parts, of what is already the most bizarre chapter in a very unusual story is that, in some respects, it doesn’t really matter what actually happened. The arguments will simply continue in their numbing cycle — on social media, in Ukrainian and international outlets, in the streets (and perhaps the rooftops) of Kyiv and other Ukrainian cities. What is Misha really doing in Ukraine? Who is supporting him? What ties may or may not exist between he and the former Ukrainian government? Just how corrupt is Poroschenko and how threatened does he feel by his former university chum? Unfortunately, they will be arguments grounded in positions and convictions rather than facts, if they ever become known. This is a big problem for Ukraine but it is also one faced by any country struggling to consolidate, or defend, its democracy. Dr. Lincoln Mitchell is an EDSN Fellow and a political development specialist based in New York and San Francisco. EDSN is an international project of the Center for Social Sciences, Tbilisi, and made possible with generous funding from the National Endowment for Democracy.